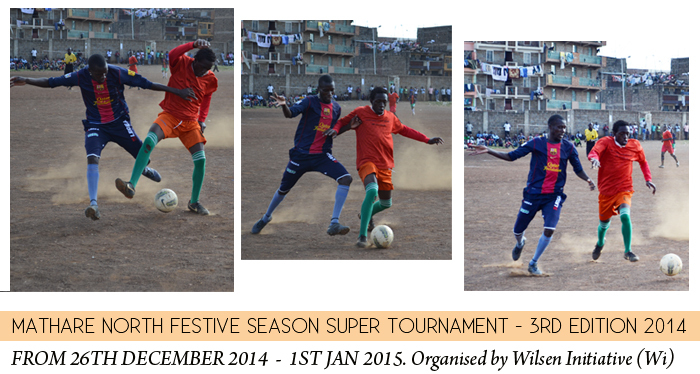 Mathare North Festive Super Tournament 3rd Edition 2014 – 2015. This is an annual tournament that is organized by the Wilsen Initiative (Wi) and the youth in the community. The tournament always kicks off on 26th December with the finals played on the new year’s celebrations on 1st January. The main objective is to connect the community through soccer during the holiday and beyond, we recognized that not all people travel out of the city during the long festive seasons due to one reason or the other and this leaves the youth with nothing to do but to indulge in other activities that doesn’t add value to their lives. In this tournament every team is a winner with the main focus not being cash rewards but rather building lasting relationships that will foster peaceful co-existing of people of different communities. This year’s theme was connecting community through soccer and talent display. In a great way we thank all the organizing committee who dedicated their time, skills and resources like making fixtures, communication, officiating etc, all the teams and their supporters for maintaining discipline, peace and fair play through the tournament. The tournament was a great success! More than 300 spectators per day, 30+ matches, 16 teams, More than 300 soccer players, More than 60hrs of community service! Join us in preparation for the 4th edition of the tournament scheduled for 26th December 2015 to 1st January 2016. ARE YOU THE MISSING BRICK IN OUR FOUNDATION? – Donate time and expertise. – Collaborate with us in hosting a youth program. 4. Organizing the annual Mathare North Festive Season Super Tournament.